Some vaccines may cause mild temporary side effects such as fever, or soreness or a lump under the skin where the shot was given. Our doctor will talk to you about possible side effects of certain vaccines. Recommendations about when to have your child vaccinated change from time to time. You can get a copy of the most current child and adolescent vaccination schedules from an organization such as the American Academy of Family Physicians or the American Academy of Pediatrics, or you can ask our office. Vaccinations usually start when your child is 2 months old and most are finished by the time he or she is 6 years old. In some special situations, children shouldn’t be vaccinated. For example, some vaccines shouldn’t be given to children who have certain types of cancer or certain diseases, or who are taking drugs that lower the body’s ability to resist infection. The DTaP vaccine is 3 vaccines in 1 shot. It protects against diphtheria, tetanus, and pertussis. It’s given as a series of 5 shots. Diphtheria is a disease that attacks the throat and heart. It can lead to heart failure and death. Tetanus is also called “lockjaw.” It can lead to severe muscle spasms and death. Pertussis (also called “whooping cough”) causes severe coughing that makes it hard to breathe, eat and drink. It can lead to pneumonia, convulsions, brain damage and death. The Td vaccine is used as a booster to the DTaP vaccine. It helps prevent tetanus and diphtheria. It’s given when your child is 11 years old or older and every 10 years throughout life. The IPV (inactivated poliovirus) vaccine helps prevent polio. It’s given 4 times as a shot. It has replaced the older oral polio vaccine. The MMR vaccine protects against the measles, mumps, and rubella. It’s given as 2 shots. Measles causes fever, rash, cough, runny nose, and watery eyes. It can also cause ear infections and pneumonia. Measles can also lead to more serious problems, such as brain swelling and even death. Rubella is also called the German measles. It causes a slight fever, a rash, and swelling of the glands in the neck. Rubella can also cause brain swelling or a problem with bleeding. If a pregnant woman catches rubella, it can cause her to lose her baby or have a baby who is blind or deaf or has trouble learning. The varicella vaccine helps prevent chickenpox. It is given to children once after they are 12 months old or to older children if they have never had chickenpox or been vaccinated. The varicella vaccine is given as a series of 2 shots. The HBV vaccine helps prevent hepatitis B virus (HBV) infection, an infection of the liver that can lead to liver cancer and death. The vaccine is given as a series of 3 or 4 shots. The HBV vaccine and Hib vaccine can also be given together in the same shot. The pneumococcal conjugate vaccine (PCV) protects against a type of bacteria that is a common cause of ear infections. This type of bacteria can also cause more serious illnesses, such as meningitis and bacteremia (infection in the bloodstream). Infants and toddlers are given 4 doses of the vaccine. The vaccine may also be used in older children who are at risk for pneumococcal infection. 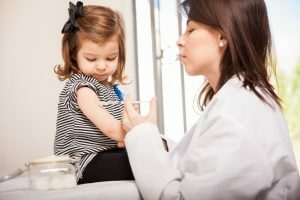 What is the meningococcal conjugate vaccine? The meningococcal conjugate vaccine (MCV4) protects against 4 strains (“types”) of bacterial meningitis caused by the bacteria N. meningitidis. Bacterial meningitis is an infection of the fluid around the brain and spinal cord. It is a serious illness that can cause high fever, headache, stiff neck, and confusion. It can also cause more serious complications, such as brain damage, hearing loss or blindness. Children should get the MCV4 vaccine at 11 to 12 years of age. Children older than 12 years of age who have not received the vaccine should receive it before starting high school. Still worried about your family’s health? We take it seriously! Visit us in Yuba City family health‘s Facilities.